University of California Press, 9780520283947, 200pp. "...in raising questions that not many others are asking about the relationship between two countries that share 2,000 miles of border, his book serves an important purpose." "...the proposals ...attempting to transform the boundary into something more than just an obstruction, are provocative and inventive." "Rael’s courageous mixture of subversion and compromise is not going to hide the affront that the border represents to those who live south of it." "While border walls and separation now seem inevitable, Rael’s subversive designs seem to indicate a way forward: They allow us to cope with the current moment by preparing for a less segregated future." "Rael sees endless opportunities for creative defiance as he exposes the wall’s xenophobic horror stories, absurdities and ironies by imagining design as both an undermining and reparative measure... [his proposals] force us to re-examine the feasibility of constructing “a big beautiful wall” around fortress America by underscoring that borders are innate zones of connectivity as much as division." 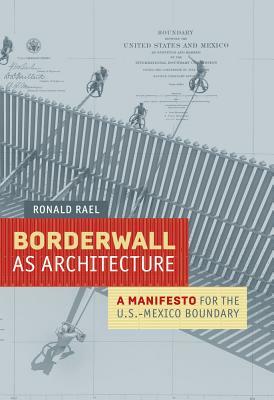 "...a timely re-examination of what the physical barrier that divides the United States of America from the United Mexican States is and could be...alongside the architectural brutality and social displacement that almost automatically accompany such borders, Ronald Rael and his contributors also explore the ways in which highlighting the border can be transformed into new opportunities." "Part historical account, part theoretical appraisal, and part design manifesto, Borderwall as Architecture is reminiscent of Rem Koolhaas’ Delirious New York in its sweeping assessment of both the sociocultural peculiarities and outlandish possibilities represented by a prominent structural element." "This is a work that harks back to the days of Buckminster Fuller and Marshall McLuhan — especially the latter."